The Methodist Hymnbook of 1933 was the first collection of hymns published by the united Methodist Church. After the First World War negotiations began between the United Methodist Church, the Primitive Methodist Church and the Wesleyan Methodist Church to form a single Methodist Church in Britain. The union was achieved in 1929 and formalised in 1932, but throughout this time plans had been set to produce a hymnbook which represented the three uniting groups. Hymnody was a strong uniting force, and so the the preface to this book began with the famous phrase ‘Methodism as born in song’ to show that expressing theology through communal song is fundamental to all Methodists. The hymnbook contains 984 hymns, divided into various sections (these are listed at the end of this article). In addition to hymns, the collection includes the entire psalter, and a selection of ‘ancient’ hymns such as Te Deum Laudamus and Jubilate Deo. 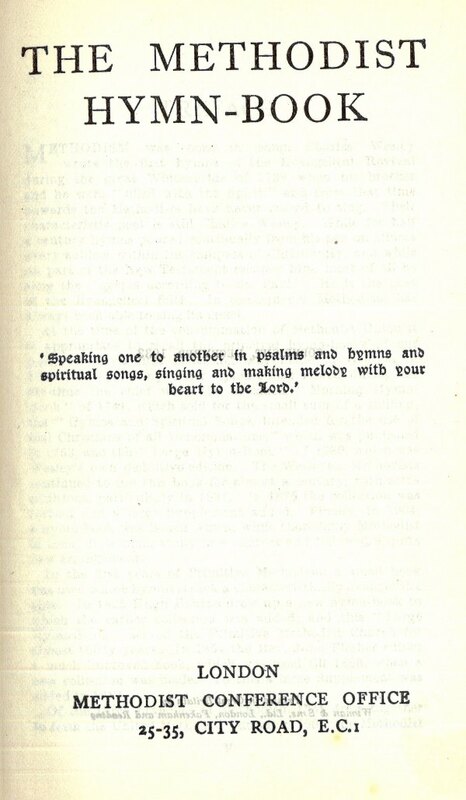 The featured picture shows the title page of the 1933 Methodist Hymnbook.